About 16 years ago, after working outside with dried grass and in the hot sun, I had my first bout with this skin rash on arm problem. I was hot and sweaty, and then, I received very stressful news. About an hour later, my forearms began to itch, and I scratched. What resulted were raised, itchy bumps, that bled when scratched. After bleeding the bump seemed to have an indented small "hole" which scabbed over. The itching remained, and I have never been able to refrain from scrathing. The bumps move around, but now, after so many years of this, I have thickening of the skin and scarring. Cortisone doesn't seem to help and pictures of eczema and other well known skin problems don't match my symptoms. I am happy that the arm rash hasn't spread much and seems to be worse on my left arm than my right. I would love to know what this irritating skin rash on arm problem is. About a year ago, I broke out in a very itchy rash on my forearms. It eventually went away without any treatment. Soon afterwards, I broke out on my legs. I thought dry skin, stress, etc., were the cause. It would look like it was healing, then come right back in the same places. No one else in my family is experiencing this leg and arm rash, so it is not contagious. I have used neosporin with limited results. Just when it seems that they might be healing, the itching becomes so severe that I scratch until I get bleeding sores again. Any ideas on this legs and rash on arms? I don't have insurance so a doctor is not really feasible. I get these small red bumps on my arms that come and go. They start with one or two and they itch and then I get loads of the red bumps all over both inner arms and sometimes the upper arms. They often disappear for a few days and return. Does anyone know what type of rash on arm or arm rash could be? 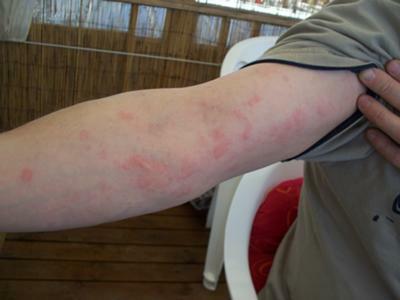 DIAGNOSE YOUR SKIN RASH at this link. I noticed a few small rashes on my right arm and thinking it was mosquito bites, I ignored it. A few days later I woke up to find both upper arms full of a small acne-like rash. My doctor thought it was a form of allergic reaction and prescribed Hydrocortisone and an antihistamine and this seemed to reduce the symptoms. Two weeks later, the rash returned with a vengence and this time quite painful causing my lymph nodes to become enlarged. This time he diagnosed shingles and prescribed Acyclovir. The rash leaves dark spots even if I don't scratch and it does not blister and does not seem to be responding to treatment. The rash is quite painful and slightly itchy. Any ideas? I am really worried now. I have tried many types of deodorants, some with aluminum and some herbal ones and not one of them work without developing an underarm skin rash. It may stop my skin from perspiring, but my skin burns from the deodorant. Does anybody have a solution? I am tired of throwing money away from buying deoderants, receiving many rashes, and feeling perspirey and sticky! I have often had a rash on the bottom of each arm right before the elbow and on each wrist. This skin rash on my arms and wrists does not itch and I have been using a steroid cream to treat the rash with no change in the skin rash at all. The bumps are round and rise off the skin surface just a little bit. The skin bumps also feel kind of hard when you touch them. There are about four or five bumps in a cluster. When I saw a dermatologist, who gave me the steroid cream, he advised me that sometimes they see this type of diabetic skin rash on arms and wrists on diabetics. I was completely unaware that I may have a diabetes health issue. I then saw my doctor at the same time the rash appeared and I discovered that I am a type 2 diabetic. I take oral medication and keep the diabetic problem under control. I am wondering if anyone has heard of this type of skin rash being associated with diabetes and if so what is the cure for this skin rash? It is an embarrassing skin rash and the steroid cream simply is not an effective treatment at all.